antici is my EEG function palette. Just a central point to convert, view (via cvec) and run wavelet analyses. Correction is very simplistic at the moment, work in progress. To import marker identifications, you specify a log file and a function that takes the filename as its argument. The function has to return a results structure including fields trialType and filename. You then specify a marker value in the marker vector of the EEG data, and those markers are replaced by the trialType vectors. 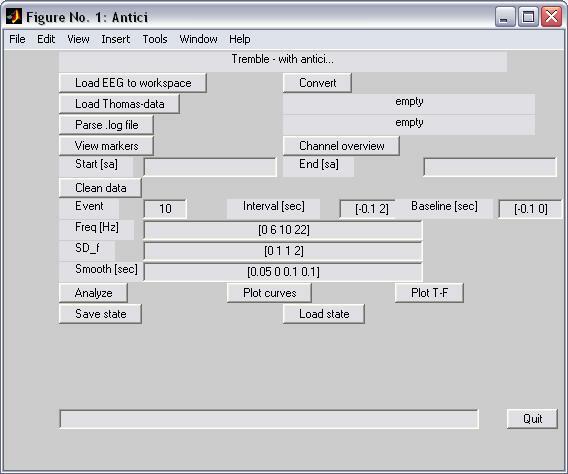 antici uses EEGLab to read data into the workspace before converting it into my standard, Brain Vison-like file format.